You are the marketing manager of a top finance company and in charge of campaigns that aim to improve sales numbers over a vast geographical region. To achieve your goals, you take the help of market segmentation strategy, of which you are aware of the basics. However, you are on the lookout for advanced tips that will help you get more value out of your target audience. Ever since evolution of marketing as an important vertical, segmentation has played an important role in market targeting and penetration. In simple terms, market segmentation can be defined as the process of dividing potential or existing customers on the basis of buying preferences. Market segmentation perfectly complements customer relationship management (CRM) with focused and targeted customer service. Greater service satisfaction and goodwill are the by-products of integration between CRM and segmentation. The success of CRM depends of quality and quantity of information. Take efforts to get maximum information about your target audience. If you are mining information from vast locations, take the help of census data for broad segmentation. You can also take the help of third party research firms who can give accurate targeting information based on family size, income bracket etc. Segment your audience based on your product and services. Mass marketing may seem easy and cheap, but the potential impact will be negligible. Unless properly executed, it will lead to resource wastage. You can segment your target market by income, age, spending behavior etc. These criteria can be implemented on a CRM platform to further segment existing customers and customize promotional campaigns that can also involve cross selling. 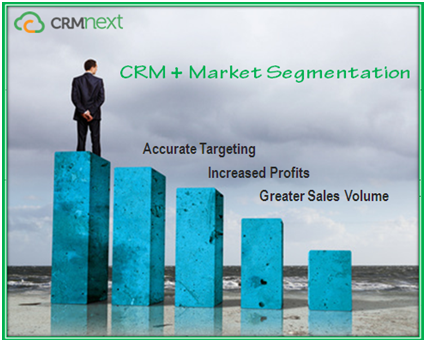 You can effectively use CRM for the purpose promoting your product or service to your segments. Some examples include loyalty programs, custom action items relevant to the customer etc. The benefits of such utilization include increased customer satisfaction that translates into retention. This in turn contributes to higher profit margins. Many leading banks and financial institutions have taken advantage of such integration. It is important to regularly evaluate market segments in order to identify opportunities and threats. Such evaluations will help you to select segments that are investment worthy and allocate budget accordingly. It will also help you to identify customer needs and tailor your products or services as per the requirements. A marketer who uses segmentation in collaboration with CRM is way ahead of competition. This is because he has additional information at his fingertips that is stored in a robust database. Information that is collected based on customer’s transaction history can be effectively analyzed with the help of market segmentation. The inherent characteristics of a customer is detailed with the help of surveys, membership cards etc. The above five tips will help you understand how to deploy segmentation to get maximum CRM benefits. Convert these benefits into accurate targeting, increased profits and greater sales volume.